I received a finished copy of this book from the publisher for an honest review. 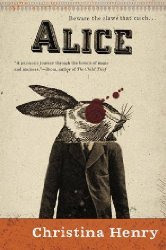 A deliciously dark and twisty take on Alice's Adventures in Wonderland that can read as both a retelling or a continuation, Alice by Christina Henry finds our heroine Alice locked away in an asylum after she is found wandering the Old City with no memory other than a bloody tea party and a man with long ears, like a rabbit would have. In the cell next to hers is Hatcher, a serial killer who lives in a world of lucidity followed by fits of madness. They form a bond, only able to communicate through nothing more than a mouse-hole in the wall. One night, the hospital catches fire, and Hatcher and Alice escape, just in time to watch the hospital crumble and something dark and sinister rise from the smoke. The world they escape into, the Old City, is run by mob bosses who each holds a portion of the city under their control. There used to be magic in this world, too, but the Magicians were long thought to be gone from the world. Now there is only the Old City, and the bosses that control it. But Hatcher and Alice know there is something else in the city now, something killing everyone in its path as it searches for the one thing that can destroy it, and Hatcher and Alice are the only two who can stop it. I love new takes on Wonderland, and thought this was an especially impressive re-imagining. Full of dystopian and noir elements, this Wonderland is certainly not full of wonders; instead it is full of dark corners and dangerous shadows, all under the control of the bosses of each district in the Old City, bosses such as Cheshire and the Caterpillar. This was something I particularly enjoyed, seeing familiar characters presented in entirely new renditions, yet staying true to their original essence. These are treacherous characters, though, and the lives of those living in their districts mean nothing to them. It is a precarious balance in the Old City, one that seems to be challenged by the bosses wanting to expand their territory, and whether they like it or not, Alice and Hatcher find themselves caught up in the disputes. Alice is not for the faint of heart. The world Henry created here is a dangerous one full of violence, and terrible things happen to the people inhabiting it. There are moments of light sprinkled here and there, but this is not really a happy book. Don't come in expecting a dream-like tale, jumping from one psychedelic adventure to the next; this is one giant psychotic nightmare. Of course, should Christina Henry ever revisit these characters, I'll be sure to find out what happens to them. After all, there are still plenty of characters from Alice's Adventures in Wonderland and Through the Looking-Glass, and What Alice Found There that we haven't met in Henry's world yet.